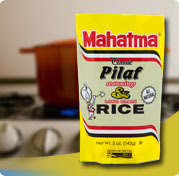 Pilaf is one of the all time classic rice dishes going back all the way to the first century Persians. By combining the very finest extra long grain rice with a subtle chicken and butter flavor, special herbs and spices and delicately toasted wheat pasta, known as orzo, Mahatma has brought the dish up-to-date, making it simple to prepare for everyday meals. Bring 1-1/2 cups of water and 1 tablespoon margarine to a boil in a medium saucepan. Stir in rice mix, cover, reduce heat and simmer for 25 minutes. Fluff lightly with fork and serve. In a 1-1/2 quart microwave safe dish, combine 1-1/2 cups hot water, 1 tablespoon margarine, and rice mix. Cover and microwave on HIGH for 3 minutes. Reduce setting to 50% power and microwave for 22 minutes. Fluff lightly with fork and serve. If your microwave does not have variable power settings, follow manufacturers directions. Not a significant source of saturated fat, sugars, vitamin A, vitamin C and calcium. Percent Daily Values (DV) are based on a 2,000 calorie diet. Enriched Long Grain Parboiled Rice [rice, niacin, iron (ferric orthophosphate), thiamin (thiamin mononitrate), folic acid], Toasted Melon Seed Orzo [semolina, niacin, ferrous sulfate, thiamin mononitrate, riboflavin, folic acid], Pilaf Seasoning [Salt, Autolyzed Yeast Extract, Partially Hydrogenated Soybean/Cottonseed Oil, Dehydrated Garlic and Onion, Maltodextrin, Turmeric, Calcium Silicate and Silicon Dioxide (prevent caking)]. Contains Soy, Wheat.